Remarkable new EP from popular Brazilian indiepop quartet Pale Sunday! Previous releases have earned the band favorable comparisons to Scottish pop legends Teenage Fanclub, celebrated Swedish pop acts Aerospace and The Wannadies, and various stars of the Sarah Records roster, among others. The new EP ‘The Fake Stories About You and Me’ features four new Pale Sunday classics showcasing the shimmering pop, warm vocals, perfect harmonies, and addictive choruses we’ve come to expect from our favorite South American indie heroes. Lead track ‘Happy (When You Lived Here)’ is yet another irresistible Pale Sunday hit—bright, melodic, sunkissed pop with jangling guitars, rich harmonies, and sincere vocals. ‘About Your Life’ reveals a band that has been listening to its Teenage Fanclub records and practicing some fuzzy guitar grooves, while ‘That’s The Way’ furthers the fascination with mid-90’s Creation releases, mixing driving percussion with nice melodies and a catchy chorus. Final track ‘The Winter Song’ celebrates the shortest days of the year with an especially heartfelt and melancholy song layered with carefully strummed guitars and prominent strings that build to an effortlessly cool conclusion. 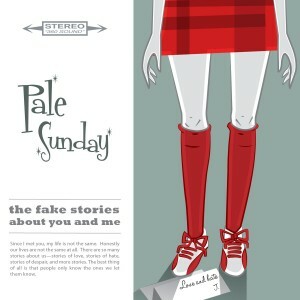 ‘The Fake Stories About You and Me’ is an outstanding release for Pale Sunday and another strong entry for the Matinée catalog.